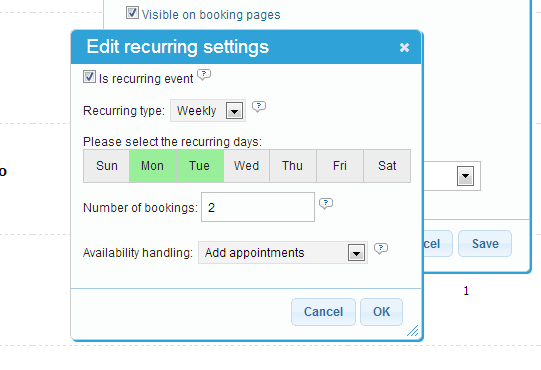 Use recurring bookings to sell service packs or to facilitate multiple bookings in to the future. 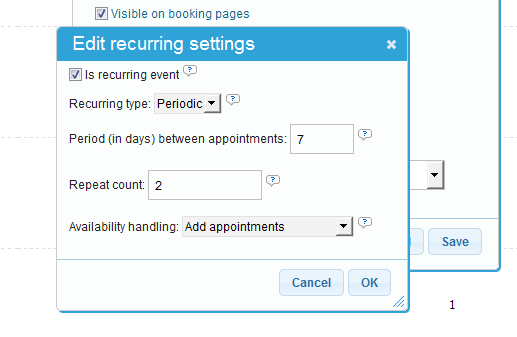 The recurring events function has been enhanced so that you can now create events with a sequence. Before you could create a service that consisted of certain days during the week (for example each Monday and Wednesday) that would then re-occur for a certain number of weeks according to the service settings. This was great for those who were selling access to classes such as private trainers, coaches etc. A client could select a date, and then get access to this class for a certain number of weeks. We have now enhanced this function with periodic sequence. This means that you can now create a service that occurs with a certain days interval. This means you can do various clever things with it. 1. Lets say that you wanted an appointment to repeat for 3 days in a row when a client makes an appointments. Then you set the period between bookings to 1, and repeat 3 times. This would allow the client to book a 3 day appointment that happens on same time each day for 3 days in a row. 2. Another possibility is to sell a X time sequence to a service pack. As an example of usage is that you could create a 10 session massage, that would happen every week on the same day and same time that client chooses. In this case you would set period between appointments to 7, and repetition to 10 times. If user would make a booking on Mondays at 4 pm, then he would get bookings every Monday for the the next 10 weeks at the same time. Remark that if a Monday is not available, you can have the appointment move to the next available Monday, or not to be bookable at all. You can choose the settings that suits you. You can also set a 14 days (2 weeks sequence), 30 days, 3 days or what ever sequence fits you to have between appointments. 3. If you wanted a client booked long into the future as a repeat client and don’t want this as a service visible on the web. Just create a new service, mark it as invisible on web, make it recurring, choose periodic, create the sequence you need, like 7 days (every week), the required repetitions such as 20 or even 52 for a whole year of bookings for selected clients. To set up a recurring service, just go to Manage – Services, create a new service or edit an existing one and check the recurring box. You can then choose whether it is weekly based or periodic depending on your needs ! In the weekly recurring settings you can choose the weekdays of appointments and the total number of appointments related to this service. can you allow customers to set up their own recurring appointments? can you allow customers to set appointments for multiple services? The clients must select from preset packs of recurring appointments. You should therefore create a few interesting packs that they can select and buy. You can base them on either recurring weekly settings or on periodic settings. One of these is certain of fulfilling the needs of you and your clients. If you need help, send us an email with description of what kind of needs your clients might have and we can come up with the appropriate solution. Is recurring and periodic booking function (usually used for travel and tours services), available for free users? Yes, it is part of basic functionality. Why does my credit card bill remain with the repeat setting even though I do not set repeat? During payment to us for your subscription there is recurring checkbox, but you can also simply go to Prices // Subscription and disable the recurring payment if you do not want it. By far most users want this to secure there is no interruption of the system in case they would forgot to pay. We have already removed the check box of the periodic contract. However, billing from stripe will be billed as a recurring contract. By the way, we use it in Japanese version. Is it a specific bug in this version? When can you get a reply? When can I get a reply?